She just won’t stop talking and interrupting other kids. He won’t sit still and pay attention. He’s impulsive and unpredictable. She won’t concentrate on getting her homework finished. They’re driving me crazy! It’s not that children with these behaviors won’t stop being disruptive; it’s that they can’t stop. Trying to get them to listen and sit still long enough to do their homework or wash the dishes is like trying to hold a wave upon the shore. Attention Deficit Disorder in children is an extremely frustrating experience for parents unless the child has been expertly diagnosed and is being treated for this condition. Pleading, punishing, bribing, and all those other parenting tricks of the trade just don’t work in children with Attention Deficit Disorder. They didn’t choose to have this condition and would change it if they could. (3) inability to wait their turn, blurting out inappropriate comments, intruding upon others and don’t think of consequences. Attention Deficit Disorder in children means that they can’t keep their minds on one thing for long and are easily bored. At school, both teachers and other kids tend to dislike their intrusive ways and become easily annoyed with them. These are the kids that get picked on even though they truly cannot change their disruptive behavior. Because of their lack of concentration, these kids are clumsy and accident-prone, causing other students to laugh at them. Undiagnosed and untreated, these children grow to adulthood with very poor self-esteem. Attention Deficit Disorder in children usually causes severe learning problems. Since they can’t focus, concentrate, or pay attention to their schoolwork tasks, their grades are poor and their deportment is even worse. They spend a lot of days in time out. Before Attention Deficit Disorder in children was fully understood, these kids didn’t stand a chance of succeeding in a mainstream classroom – Discipline problems, they were called. Ostracized by their peers, disliked by their teachers, and severely punished by their frustrated parents, children with Attention Deficit Disorder grew into adults with major depression and relationship failures. What’s the Future for Children with Attention Deficit Disorder? In a word – bright! Medical science now knows what defines this disorder and how it’s successfully treated. When correctly diagnosed and treated, these kids have every chance of academic and social success. Since the Surgeon General report in 2001 officially recognized this disorder as a brain dysfunction, all the stigma of being stupid, irresponsible, and intensely frustrating has lifted. On appropriate medication and often in special education classrooms, children with Attention Deficit Disorder flourish in their studies and in interactions with their peers. Homeopathy is safe and effective natural medicine with a high success rate in treating emotional and behavioral disorders in children and teens – including attention deficit, hyperactivity, depression, apathy, anxiety, anger, aggression, defiance, and obsessive-compulsive disorders. Rather than suppressing symptoms, homeopathy seeks to create deep, long-term behavioral changes. 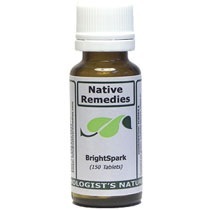 BrightSpark is a safe and effective remedy that has been tested over the years in the treatment of hundreds of children in her practice. Feedback from parents and teachers has been consistently good.